Indeed, no kid in the world would never recognize ice cream as it is often associated to their childhood. With the emergence of our modern world of technological innovations, ice cream too has made its way to various blends and mixes. This is the proper time when the idea of making fun foods arises. 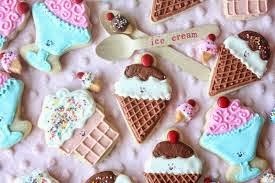 Ice cream and cookies are two foods that are ideal and appealing to kids. Blending these tasty foods and cooking them in various easy and fun recipes may serve as fun desserts loved by children. Cook an Ice Cream Pizza Cookie using kids’ favorite cookie recipe with dough coating the bottom of the pizza pan. Spread a layer of softened ice cream with cookie once the pizza is already baked and cooled. It should then be placed in the freezer for about one to two hours to make the ice cream firm. Once done, you may add favorite toppings of kids such as nuts, chocolate sauce, sprinkles, gummy worms, and caramel. Another tasty ice cream and cookie treat is the Ice Cream Cookie Crunch with primary ingredients like chocolate cookies, chocolate chips, and vanilla ice cream. This can easily be made by placing ½ cup of ice cream atop a cookie’s one side and followed by another layer of ice cream, making it simply a sandwich. Make a lot of sandwiches and roll their sides in chocolate chips to adhere to the ice cream and wrap them tightly. The sandwiches be them placed in the freezer before being served to kids. A cake cooked out of cookies and ice cream is also possible, as manifested in the recipe called Chocolate Chip Cookie Ice Cream Cake. This can be done by crushing chocolate chips to come up with crumbs and blend it with margarine. The remaining cookies should stand on the sides of the pan, while fudge topping be spread over the crust and let freeze for approximately 15 minutes.